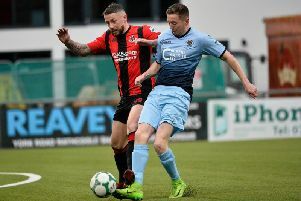 Warrenpoint Town produced the late, late show on Saturday to see off Cliftonville 2-1 in the Danske Bank Premiership. The Reds had led 1-0 through Joe Gormley before Anto Reilly and Alan O’Sullivan scored in second half injury time to seal the win for the home side. Both sides made a bright start to this encounter and it looked as if a good game of football was on the cards. Right on the stroke of half-time Cliftonville’s Gormley back heeled it to Ryan Curran but his shot was easily gathered by Town keeper Berraat Turker. The home side had a chance in the 63rd minute. Griffan found Eamon Scannell who blazed over when he should have done better. It was 1-0 to the Reds in the 72nd minute. A long throw-in from Levi Ives was cleared to Ryan Catney. He headed it back in to the box and Gormley turned and drilled the ball home to claim his sixth league goal of the season. Gormley nearly made it 2-0 in 85th minute. His free-kick curled round the wall but keeper Turker did well to push away the effort. Right at the death it was 1-1. Eamon Scanell found Anto Reilly from a free-kick and he headed home and it was game on. And then with the last kick of the match Alan O’Sullivan raced down the left and fired home to make it 2-1 in the 95th minute and seal the win for the home side. It was a fantastic end to the encounter. What an end to the game and the home side will be delighted to get valuable points on the board. Warrenpoint: Turker, Hughes, Moan, Griffin, O’Sullivan, Mccaffrey, Kouogun (Reilly 82mins), Watters (Kelly 70mins), Scannell, Norton, Wallace. Cliftonville: Brush, McGovern, Ives, Breen, C Curran, R Curran,Catney, Gormley, J Donnelly (Garrett 40), Maguire (McDonald 45), A Donnelly (Harney 45mins). Subs not used: Neeson, McDonald, McConnell, Lavery, McMenamin.